For most people, director Tommy Wirkola’s Hansel & Gretel: Witch Hunters is his most well-known work. It’s certainly his first foray into American cinema, which grossed over $50 million dollars. There are, however, those of us who knew of Wirkola’s work well before his 2013 American debut. In 2009, Wirkola released Dead Snow, a film about a group of kids taking on Nazi zombies in the snowy mountains of Norway. While it did receive a stateside release in the summer of 2009, it grossed less than $50 thousand dollars. but eventually gained a cult following on Netflix. Now Wirkola announced that he would be working on a sequel entitled Dead Snow 2: War of the Dead and it sounds awesome. According to Wirkola, the film will be shot in both English and Norwegian. "In the sequel the story follows the sole survivor of a Nazi zombie attack who battles an even larger army of zombies with the help of a professional gang of American zombie killers who call themselves the Zombie Squad ... 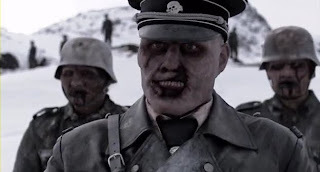 I am delighted to step back into the world of Nazi zombies yet again with Dead Snow: War Of The Dead, a world that is very close to my heart [...]We have a script that I am super excited about, which is bigger, scarier, funnier, more action-filled and gorier than the previous one, and I can't wait to unleash another horde of undead Nazi zombies onto the world again." For those who were lucky enough to attend the Cannes film festival this year, a 5-minute sneak peek was shown and it has received two very enthusiastic thumbs up. The teaser was shot in April, and filming/production on what sounds like a great sequel will pick up again in August and September. So far there is no release date.